The purpose of GHS is to make it easy to identify chemicals and potential hazards that are shipped all over the world. All employers must train employees on new GHS label elements and the updated Safety Data Sheet (SDS) format. The purpose of a Globally Harmonized System of Classification and Labeling of Chemicals (GHS) is to eliminate confusion surrounding hazard communication. The system features standard, universal symbols that communicate important hazard information, create a classification process, and identify hazards to the users. Any person in any country can understand this system. Seton has all the GHS Products you need to get started, including GHS Signs, GHS Labels, and GHS Posters featuring all the GHS Pictograms. Maintain GHS compliance by first training your employees in the new regulations using a variety of training tools, including GHS Training Packages and GHS Employee Training Kits. After training, hand your employees GHS Wallet Cards that serve as a quick reference as they become more familiar with GHS. Wallet Cards explain the GHS pictograms, how to understand a GHS Label, GHS key terms, and tips for writing and using a Safety Data Sheet. Seton also offers GHS SDS Binders that store critical Safety Data Sheets in one, organized place. Binders are available in 2, 3 or 4 and all come with a 36 chain and two S-hooks to attach to any wall, rack, or station. 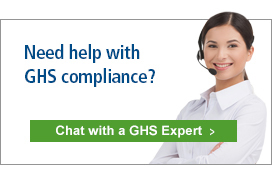 Maintain GHS compliance today using a variety of GHS products from Seton.